The Ann Sothern Show was a 30 minute comedy series on CBS about the assistant manager (Katy O'Connor) of a chic New York City hotel. Most of the storylines centered around the lives of Katy, her fellow hotel co-workers, and hotel guests. Katy had a potential romantic interest with James Devery that almost, but never quite, happened until the end of the series. Starting with episode #24, the Ann Southern show underwent drastic changes. The hotel manager was transferred to the hotel in Calcutta. The new manager was James Devery, a younger, unmarried man who provided Katy with flirtacious opportunities. Katy also gained a roomate, best friend, and secretary when Olive Smith joined the show. A young bellboy with a crush on Katy named Johnny Wallace was added and a suave room clerk with a French accent named Paul Martine appeared. In 1959, the Ann Sothern show won a Golden Globe Award for the "Best TV Show". Ann Sothern herself was nominated that year for an Emmy as "Best Actress in a Leading Role in a Comedy Series" but she lost the award to Jane Wyatt for her role on, "Father Knows Best"! 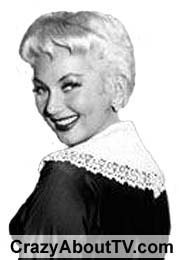 The Ann Sothern show was not Ann Sothern's first TV series. She had previously starred in the highly successful series, "Private Secretary", which ran for five seasons and 104 episodes! Ann set a record on that series by becoming the first working woman on a U.S. TV sitcom! As a compliment to that record, Ann had already played the part of a "working girl" secretary on the "Adventures of Maisie Radio Show" for 7 1/2 years! You'll notice that several of the Ann Sothern show's Cast also starred with her on Private Secretary! Don Porter, Jesse White, and Ann Tyrrell were all major characters on both series! Lucille Ball appeared in episode #36, "The Lucy Story". She played Lucy Ricardo, her well-known role established on the series, "I Love Lucy" and continued on "The Lucy-Desi Comedy Hour". Actually, the Ann Southern show was produced at Desilu Studios which was owned by Lucille Ball and her husband Desi Arnaz. Thank you for visiting our The Ann Sothern TV show page!